Mayo knew before throw in that they still have plenty of work to do if they are going to stop Dublin’s drive for five All Ireland titles later on in the Summer, but if they were in any doubts they were given another warning of what they will have to do in a few months time to catch the Dubs. After three wins from three in the league hopes were high that Mayo could inflict a third defeat on Dublin in this years league, but from the off they were off the pace both in open play and with their shooting boots as Dublin eased to a eight point win in Croke Park. Mayo managed to kick just three points from play over the entire contest - with Rob Hennelly and Jason Doherty their joint top scorers on the evening both kicking two points each from placed balls. They also have to play 20 minutes of the game with 14 men with both Lee Keegan and Seamus O’Shea picking up black cards in either half and kicking 14 wides during the contest. Mayo also missed a penalty in the first half but that would have only added a cosmetic look to the scoreboard at the end of the day - as Dublin were fully deserving winners on the night. The first half was a forgettable affair for Mayo as Dublin looked to be in cruise control for long periods, with a number of fine saves from Rob Hennelly keeping the score down to a respectable number at the mid way point. Mayo also had to deal with losing Ger Cafferkey and Ciaran Tracey to injury during the half and see out ten minutes without Lee Keegan who picked up a black card 26 minutes in for a body check after he laid off the ball. 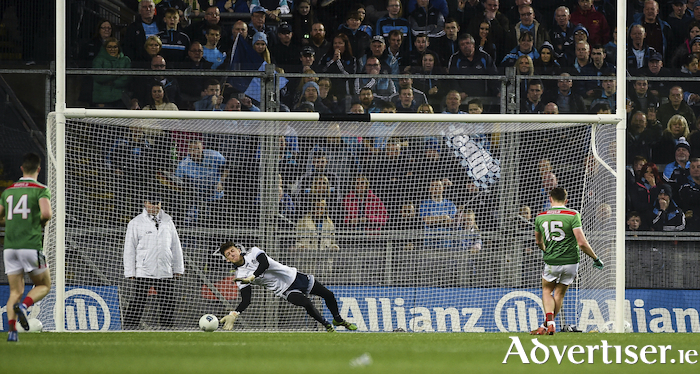 Jason Doherty had the opportunity to bring Mayo much closer from the penalty spot after he had been fouled by Johnny Cooper on 33 minutes, but his effort was well saved by Evan Comerford in the Dublin goal. Mayo’s top scorer in the half was Hennelly who kicked a long range free and 45’ from the save by Comerford from Doherty’s free with Fionn McDonagh’s point 17 minutes in the high water mark for Mayo’s attacking efforts from play in the opening 35 minutes. That score had pulled them level at 0-2 each after Paul Mannion and Cormac Costello kicked the first two points of the day. From then on in it was all Dublin with All Ireland champions cutting through Mayo at ease on numerous occasions. Costello rattled the back of the Mayo net just after McDonagh’s point, twisting Keith Higgins inside and out before firing it past Hennelly at his near post. Jack McCaffrey, Mannion and Costello twice could have hit the back of the net again before the short whistle only for Hennelly’s heroics and some good clearance work by the Mayo defence from the rebounds. Dublin tagged on four more points before the break to go in leading 1-6 to 0-3 and leave Mayo with a huge hill to climb. But in the second half they came nowhere near climbing that hill as Dublin eased their way home to the two league points - in a final 35 that didn’t leave the 35 thousand plus who paid in chomping at the bit for the seven minutes of injury time that was played before it’s conclusion. Matthew Ruane did bring Mayo a bit closer with a point right from the restart but it wasn’t the jump start they were hoping it would be. Mayo wouldn’t score for another 13 minutes, while Dublin were far from prolific in front of the posts, they did manage to tag on two more scores in that period from a Costello free and a Con O’Callaghan effort to have the All Ireland championswith leading 1-8 to 0-5 with 22 minutes to go. It was all matter of seeing it out from there on in and when Seamus O’Shea was shown a black card for a hand trip on 50 minutes, Mayo’s goose was finally cooked as Dublin had an extra man to play with for the second time in the game. Dublin saw out the closing stages at their ease, with Brian Fenton, Costello and a brace of pointed frees from Dean Rock seeing out the scoring for them and Mayo kicking their final couple of points from a brace of Jason Doherty frees. Dublin: E Comerford; D Byrne, M Fitzsimons, E Murchan; C O’Sullvan, J Cooper, J McCaffrey; B Fenton, D Gavin; B Howard, C Costello, N Scully; P Mannion, C Kilkenny, C O’Callaghan. Subs: D Rock, P Andrews, S Bugler, D Daly, M D McAuley.